In my thoughts I sometimes go back to my childhood days with my grandparents and cousins in a picturesque mountain village called Martinovo with sheep, goats, vegetable gardens, orchards, meadows, Ogosta river and wild forests. My heart fills with happiness reflecting on the summer and winter vacations full of flavours, time outdoors and in the nature, and also some hard work in the fields. We often had vegetarian dishes for lunch and dinner and occasionally red meat, I would say rarely, sometimes chicken & hen soup and stews. Abundance of garden grown vegetables rich in taste and flavours and local vegetable varieties, lots of legumes and naturally ripe fruit. Amazing. My love for veggies and fruit dates back to those times, similar for the seasonal products that follow the rhythm of nature and our body. My grandparents until their 70s were taking care of their beloved goats and sheep, each one with a joyful name. We were cherishing their generosity of fresh milk and homemade fresh cheese and yoghurt prepared by my grandmother every day. I also remember my reservations towards the dairy products, the flavours were either too intense for my taste or my nose was too sensitive for those gifts of nature loved by everyone except meWhen I tell this story I make a bridge to the philosophy of the Mediterranean diet and see lots of similarities except for the olive oil not indigenous to Bulgaria. Reflecting on the traditions (before the modern times boost and globalisation) and my love for the MedDiet philosophy I see many touch points of our local cuisine and the Mediterranean flavours ~ I would say not by chance as Bulgaria is a crossroad between Middle East and Europe and connects culturally with the countries around. Furthermore, it has an abundant land and beautiful fertile landscapes to plant. Naturally extra virgin olive oil perfectly harmonizes with the local dishes and could easily replace animal fats or modern seed oils. I love Bulgarian yoghurt unique with its recipe & bacteria composition (lactobacillus bulgaricus and streptococcus thermophilus) giving very tender texture and mild taste to the yoghurt. Amazing that Bulgarian yoghurt is a much loved product in Japan with the highest consumption there! I enjoy yoghurt for breakfast and use it for some traditional dishes with yoghurt sauce, also for dips and the delicious cold soup tarator ~ a fantastic multiuse basic product for our cuisine bringing freshness and lightness to the dishes (vs. sour cream for instance). In spring and summer we traditionally cook green dishes and pies with spinach, nettle, beetroot leaves and wild grown leaf vegetables. The preparation often goes with rice and eggs like the above dish of spinach and nettle with rice. I brought freshness with the yoghurt sauce and some spiciness with pepperoncino and wild oregano. And Peranzana variety of extra virgin olive oil from Puglia that carries the green tomato and almond notes, as well as some sweeter spicy notes ~ a magic combination with the greens and to give a final touch to the dish. In this case I also cook the dish with a simple extra virgin olive oil, simmering some onions as a start and cooking the dish at low-medium heat until ready. The typical cold summer soup Tarator combining yoghurt, cucumber, walnuts, garlic, dill or mint as a newer interpretation goes perfectly with extra virgin olive oil ~ either a more delicate option to round the flavours such as Arbequina from Spain or a medium Koroneiki from Greece. I’ve tried it with a green herbateous early harvest Chondrolea from Chalkidiki in Greece or Casaliva from Garda lake and it also turns amazing and vibrant and bright in flavours. As mentioned many times, once we take the olive oil path we walk along and love the journey, and very often we get into the experimenting spirit to bring contrast and sparkle to our dishes. Sky is the limit and our explorer’s spirit and intuition turn into guiding stars! Eggs pair fantastically with olive oil and yoghurt. Eggs Panagyurishte style are a great example ~ we prepare poached eggs and serve them with a yoghurt sauce, some aromatic sweet paprica and extra virgin olive oil. Traditionally this recipe is made with melted butter mixed with sweet paprica. I replace the butter with extra virgin olive oil not only to elevate the flavours of the dish, but also to enhance the health dimension ~ bringing Omega 9 (oleic fatty acid that is monounsaturated in nature is the main EVOO fat), vitamin E and K, Squalane (caring for the skin), as well as beneficial phenolic antioxidants with anti inflammatory and protective function that are abundant in extra virgin olive oil. The typical Snezhanka yoghurt salad and dip prepared with fresh or pickled cucumbers (depending on the season), walnuts and dill goes perfectly with extra virgin olive oil instead of the traditional sunflower oil. In this case the dish flavours are brought to a new level vs. the ones of sunflower oil that loses its flavours and qualities while being refined (most of the sunflower oils are chemically treated during the refining process at a very high temperature). Let’s not forget that extra virgin olive oil is a 100% natural oil extracted mechanically and solely from the olive fruit at controlled low t° equal/below 27°C, allowing to preserve the unique qualities of those precious 2% that are non-fat (i.e. vitamins and phenolic compounds/antioxidants). With olive oil we also bring a more balanced fat intake in favour of Omega 9 vs. Omega 6 (contemporary seed oils such as sunflower, corn, soya, etc. are rich in polyunsaturated fatty acids, many of the industrial foods too leading to excessive consumption of Omega 6). Sirene (white cheese) is another traditionally consumed product literally all day long starting with breakfast (grilled sandwiches, fresh with tomatoes and bread, with crumbled eggs and omelette, etc). I love simple dishes allowing for dedicating time to myself and to the close to my heart people. Sirene po Shopski is a great example how cooking and enjoying time go hand in hand. I always look for novelty and ways to bond traditions, thus I linked the typical Bulgarian taste with a Mediterranean touch in the dish below ~ Sirene po Shopski with fennel. 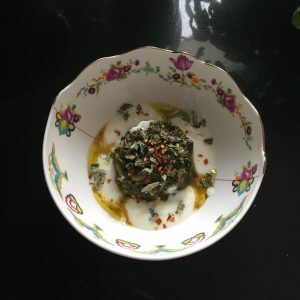 The flavour combinations got truly fascinating into this light dish adding olive oil instead of sunflower oil or butter ~ clean taste emphasizing the rich flavours of sirene, tomato, fennel, egg and herbs. In each clay pot we place a cheese slice, the tomatoes and the fennel. We sprinkle with EVOO and the herbs and cover with the lid. We bake in a preheated oven for about 30min. at 180°C. The smoke point of EVOO oils is between 190-210°C therefore oven baking and grilling with extra virgin olive oil is very suitable and tasty. We take off the lid, add the egg and bake for another 5 min until the egg is ready. We serve with some EVOO on top, fresh parsley or dill. I love more intense and peppery oils especially with sheep cheese ~ the more pronounced flavours pair in harmony and give stronger character to the dish. Certainly milder EVOOs go also well for bonding and rounding the tastes. ~ I wish you an ultimate delight for the senses!